Secure Agent Leads offers results-driven advice for closing leads. 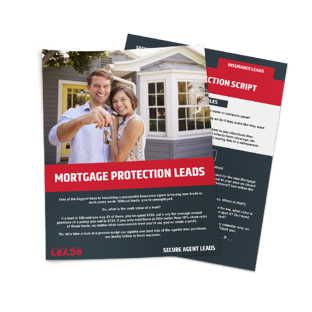 Here is the Mortgage Protection Script and Strategy we provide to all of our agents. At Secure Agent Leads we have a proven system, and we know you can make it WORK. Statistics show that 80% of sales happen between the 5th and 12th contact. Make the numbers work for you. Be consistent, persistent, and dedicated. These are simple strategies you can start using right now. Download the PDF and start improving your closing rate right now.